Today I’m joined by Helen Vivienne Fletcher, the author of Broken Silence, an edge-of-your-seat YA thriller that I absolutely love. You can read my review of Broken Silence here on the blog. After reading Broken Silence I had a few questions I was dying to ask Helen. Read on to find out what inspired Broken Silence, the journey that Helen went through to get her book published and how she creates such believable characters. What inspired you to write Broken Silence? I came up with the idea for Broken Silence when I was a teenager. My friend was staying over and we were watching I Know What You Did Last Summer and Scream. We started coming up with our own stories, and the basic plot outline for Broken Silence was one of the one I made up that night. The idea stuck with me, though obviously a lot changed in the time between coming up with the idea and actually putting pen to paper as an adult. Your main character Kelsey is dealing with a lot in Broken Silence. Did you need to research the sort of situations that Kelsey finds herself in? I used to work as a mental health phone counsellor. Over the years I spoke to many people in abusive relationships, or other dark situations. From the outside it can be hard to understand why people stay in these type of situations, or don’t ask for help, but when you are in a dark place it is so incredibly difficult to ask for anything, or even see the situation for what it is. Talking to people on the phone line showed me that, time and time again, and gave me a real insight into how this can feel. While of course I didn’t, and would never, write about anything I was told in those conversations, they did give me an understanding of how to write Kelsey’s character. Your characters are so well developed that you have readers thinking that the Kelsey’s stalker could be any of them. How do you ensure that your characters are believable? Funnily enough, character is actually one of my weak points in writing. When I start working on a story, I have lots of ideas for what could happen, but I usually only have a very sketchy idea of who it happens to. The upside of this is that it does force me to do the work. Before I get too far into the story, I have to pause and spend some time developing and figuring out who my characters are. For Broken Silence, I spent quite a bit of time looking at stock images of faces to figure out what my characters looked like, and wrote pages of notes about each one. This really helped with understanding how they would react in different situations, and made it easier to write them as whole people. Broken Silence is one of those books that affected my mood as I read it as it’s quite unsettling at times. Did you find the story seeping in to your life as you wrote it? Yes, definitely. I wrote the first draft over a period of a couple of years, and there were times where I had to pause for a few weeks then come back to it. It occupied a lot of my headspace, while I worked out all the plot twists and turns, and I had so many mental conversations with the characters. There was some parts which were really hard to write, as I’d become so attached to the characters. At times they felt more real than the actual people in my life. Broken Silence reminded me of some of my favourite adult thrillers. Thriller is a genre that is rare in New Zealand Young Adult fiction though. What drew you to this type of story? I’ll be honest, I’m not sure I knew I was writing a thriller when I started Broken Silence. I think I just find both writing and reading dark stories quite cathartic, and I know other people feel the same, especially teenagers. When I was a teenager myself, I liked dark, intense stories, and that’s what I wanted to write. I remember everything felt so important and so full on all of the time. The emotion in these dark stories matched those feelings in a way that left me feeling understood, and I think that’s something that many teenagers experience. I sometimes get surprised looks when I tell people about my writing, as I’m little and smile lots, so it’s not what people expect, but it’s what makes sense to me to write. Do you have a plan when you write or do you just see where the story takes you? I have a plan of the overall shape of the story, and several plot points that I know are going to happen along the way. The bits in between those plot point, I just see where the story takes me for the most part. For example, I didn’t know Mike had a sister until she walked into the story as I was writing. I do quite often end up waking up in the night to write down ideas for things that could happen, though, so I guess most of the time I am still planning along the way as well. I think a mix of both works well for me. What was your journey to publication? Why did you decide to independently publish your book? If you’d told me when I started this project that I would end up independently publishing, I probably wouldn’t have believed you, as that wasn’t something I thought I could do well. I was also really worried that if I couldn’t get a traditional publishing deal, it must mean the book wasn’t good, and I therefore I probably shouldn’t independently publish it either. I spent a lot of time submitting Broken Silence to traditional publishers and competitions. Through this, I realised that the book must be good, as I was getting great personalised feedback from each, and many said they wanted to be able publish it, but in the end they were still turning it down for various reasons outside my control. I came very close to getting a deal last year, but ultimately that fell through at the last minute. I was just about to give up when an online course on self publishing popped up in my Facebook newsfeed. I decided to do the course, just to figure out whether self publishing was a realistic option. The course was so inspiring and helpful, I decided to go for it, and I’m so glad I did. Fleur Beale, Kate de Goldi, Diana Wynne Jones, Paula Boock, Melina Marchetta… and so many others. Peter Millett is the author of the funny, action-packed secret agent series, Johnny Danger. So far there are two books in the series, D.I.Y. Spy and Lie Another Day. With the third book, Spy Borg, being released in September Peter wants to give readers a special preview of the cover. 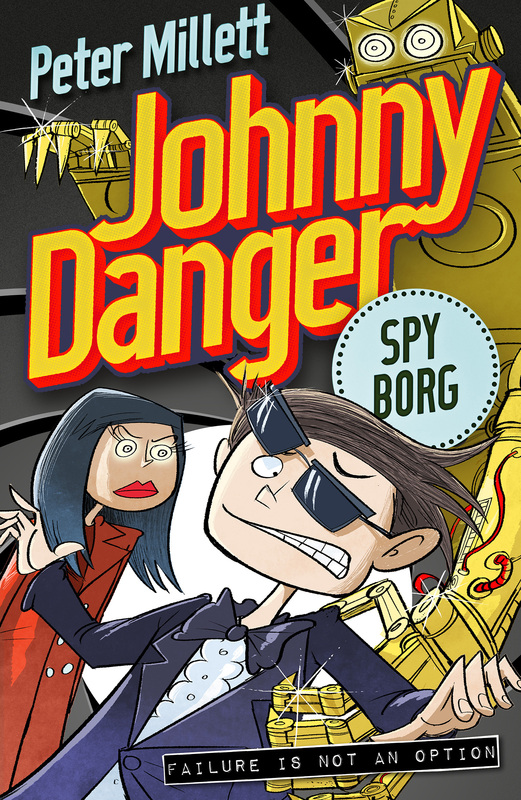 Peter joins me today to talk about why he created the Johnny Danger series and gives us a sneak peak of the Spy Borg cover. Johnny Danger is turning into one of the most fun projects I have ever worked on in my career as a children’s author. I’ve created the series with two audiences in mind: students and teachers. Firstly, students aged 8 – 12 years will enjoy the slapstick comedy, outrageous pranks, spectacular action sequences and unpredictable story twists that Johnny Danger and Penelope Pounds experience as teen spies working for MI6. Secondly, teachers and parents will appreciate the fun I am poking at the James Bond spy series and enjoy the subtle sense of hidden humour that is at play in the background. I am an eternal prankster and I have purposely littered the book with all sorts of comedy traps to catch readers of all ages off-guard. My wife has taught Year 6 students for over 20 years and I am more than aware that teachers re-read certain stories in their classrooms each year and that they want these stories to maintain a fresh and energetic feel over multiple readings. The Johnny Danger series has been created for such purposes. The comedy is broad and will appeal equally to both boys and girls. I’ve gone to great lengths to construct well-planned plots that end satisfactorily and unexpectedly. I’ve also made sure that the scatological humour used in the books doesn’t overtake the storytelling. Additionally, books one and two contain DIY spy codes that can be emulated in the classroom by students. The first book uses humorous anagrams as the basis of an intricate software hacking system, and the second book uses upside down calculator spelling words to hide vital codes. Both these DIY codes can be created by student readers with everyday school or household resources. We live in an increasingly multimedia-orientated world and I have decided to embrace a number of new technologies to help connect readers with the Johnny Danger series. Finally I made an appearance on national television so that readers could hear first-hand what they were in for if they read Johnny Danger. I hope the Johnny Danger series is remembered as one of the funniest sets of children’s books ever to be released down under. I also hope that reluctant readers find them a gateway to discovering a love of comedy fiction. As a ‘special feature’ to this blog I’m including the world premiere of the cover of book three “Spy Borg”.